Jacques Simon Levy Calvo studied primary and grade school at Markham College in Lima, Peru. He is an economics graduate from Oberlin College, Ohio, USA, and earned a Master’s Degree in Leadership from Andrews University, in Michigan, USA. He founded and was managing director in Banco Latino and Executive President in Banco Nuevo Mundo. He also founded and is presently CEO of Los Delfines Hotel, in Lima, Peru. In 2000, Jacques Levy was accused of fraud without proof. He was excommunicated and was repeatedly threatened to be sent to jail. However, he decided to stay in Peru to pursue his struggle and press charges against the Peruvian state for having robbed his family’s Banco Nuevo Mundo, and to get the information that would uncover the dark interests and the true criminals behind that theft. His 10-year old struggle evidences how absurd those accusations are. 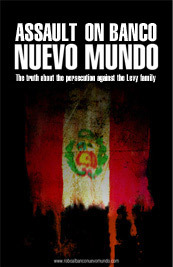 As a result of the persecutions narrated in this book, after more than a decade of litigation before Peru’s courts, he has been forced to give up his Peruvian nationality though he retained his French passport. Presently, Jacques is committed to research on dolphins in Peru, and devotes his spare time to music and enjoying a quiet life in Jupiter, Florida, USA, where he lives with his daughter Estrela, and Merlis and Joseph, his new family.